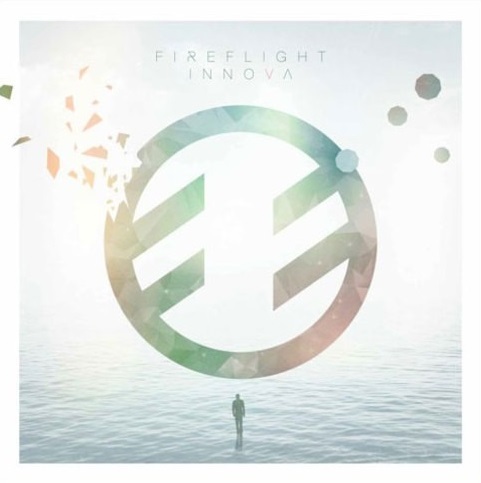 It’s probably no coincidence that adversity feeds creativity, and in the case of modern rockers Fireflight, every ounce of pain, uncertainty and frustration paved the way for progress on its fifth long player INNOVA (more on that mysterious title in a minute). In addition to leaving major label life behind after eight years, the band that’s been together since 2000 trimmed down to the foursome comprised of vocalist Dawn Michele, bassist Wendy Drennen, guitarist Glenn Drennen and drummer Adam McMillion, all of whom encountered a lengthy season of grueling songwriting to not only refine themselves as artists, but also as human beings committed to a purpose-driven career defined by authenticity at every melodic turn. Another fresh turn of the page came from willingly leaving label life after an immensely fruitful run under an arm of Sony that yielded a Grammy nomination, the soundtrack for NBC’s “Bionic Woman” promos and victory in Taco Bell’s “Feed The Beat” campaign that catapulted the players towards a performance at the mammoth X Games. Considering that pedigree, not to mention having toured all over the United States countless times, trips to Europe, plus an immensely feverish fan base through Latin America (particularly Brazil), Fireflight decided to turn over the keys to crowd funding platform Pledge Music. Add up all of the above, alongside the fact that this is Fireflight’s most diverse yet simultaneously vulnerable disc thus far, and the new album’s moniker INNOVA (the Latin word for “renew”) is indeed a fitting phrase. And there’s even one more upswing to that pendulum courtesy of Dawn, who recently announced she and her husband are expecting their very first child early next year. “We’ve always liked words with a strong visual presence that have the potential for hidden meaning and symbolism in the art work,” offers Glenn of a title that’s stirred up quite the curious enigma for longtime listeners. Besides all the musical strides everyone has made collectively, members have literally grown up together from wide-eyed teens through young adults, who’ve certainly found significant success thus far, but will be the first to admit there’s still a lot to learn. “I’m really ignorant about how much having a baby will change my life, but I’m keeping a cool head about it,” admits Dawn of the unexpected delight, before Wendy, who has a four-year-old with bandmate/husband Glenn, lends some sisterly advice. “Ignorance is bliss! You’ll need to keep a flexible mindset for sure, but you’ll also always have the support of everyone around you.” All of these many emotions are noticeably present within the consistently expressive INNOVA, anchored by the lead rock single “Resuscitate,” which stays true to Fireflight’s heavy musical roots across a narrative of feeling pushed to the absolute limit, but nonetheless suggests digging down deep within a well of faith for a jumpstart rather than simply throwing in the towel. Clad in the up-tempo tradition of Katy Perry’s “Firework,” “Lightning” continues in the group’s lengthy line of empowerment anthems, dismissing the media’s perfectionist lies and channeling the power of one friend believing in another (so much so that they may even feel capable of conquering the world by the end of the sing-a-long). The amped up energy of “We Are Alive” taps further into the concept of community and the ability to build one another up, while the aggression-fueled “Keep Fighting” makes a pretty convincing case that a relationship must go beyond the definitions of society’s more disposable side and truly invest into each other’s well-being, even when circumstances get a little rough around the edges. “With this record, we specifically took a step back and pinpointed everyone’s individual strengths and roles in the band,” discloses Glenn.